Titans cross-country coach Charlotte Camp could not be more proud of her girls’ team’s fifth-place finish at states in Colorado Springs on Saturday, October 27—or of her team’s performance all year long, for that matter. The girls’ team finished in first or second place at every race it entered this year, to advance to the state meet for the second year in a row and the fifth time since the team’s inception. Last season, the team took third place at states but for Camp, this year’s performance was even more impressive. "The field was significantly larger due to an increase in schools in the 3A division," explains Camp. "The level of competition was notably sharp—fierce actually." In fact, the 3A race was choked with a staggering number of runners, as 25 full squads brought in 152 runners for the girls’ race alone. 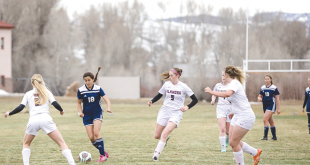 In addition, most of the competition hails from schools three times the size of Crested Butte Community School, as well as from the private sector, and have established themselves as elite running programs. Despite the staggering strength of the field of runners, all five Titan girls positioned themselves at the start line with their strategy and confidence intact. "We expected a fast start and a demanding pace, and among our strategies, we planned to run as tight as possible to keep our overall team score low," says Camp. Once the race started, though, the Titans found a faster pace than initially expected as the competition took off the line at a furious tempo. Senior Emma Coburn kept up with the lead pack to establish her position early, but the rest of the Titans got caught in the masses, causing chaos for the Titans as the course headed into the first turn. Freshman Erin Kelly fell victim, literally, to the pinch at the turn as she was tripped up and launched into a full-on Superman slide with runners all around her. Remarkably, Kelly avoided being trampled by the herd of harriers and recovered to join junior Emma Vosburg for a full-tilt push through the pack. By the time the field settled, the Titans girls found themselves a bit behind their expected positions, but were determined to battle through the chaos. "The girls had good placement, but not where we are used to or where we would have liked ideally," explains Camp. "It was still good, but it did mean a bit more fighting during an already fast race to make advances." Freshmen Madeline Malzhan and Hannah Smith put together their best efforts in the midst of the huge pack. Malzhan maintained her fastest pace all season, destined to set a personal record at the hardest race of the year. Smith’s push was of a different ilk, as a horrible side cramp crept into her midsection, nearly ending her first state meet performance. "Hannah’s comeback is quite honestly one of the best I’ve ever seen," says Camp. Meanwhile, Coburn was entrenched in a battle with the cream of the 3A state crop at the front of the pack. Coburn helped lead the Titans to their third-place finish last year with a fourth-place finish and looked to repeat, if not improve upon, her performance this year. Coburn did just that to take fourth place overall with a time of 20:02, five seconds faster than last year, and earn another all-state title. Vosburg and Kelly managed to pass 20 runners by the time they reached the finish line to take 46th and 49th place with times of 21:40 and 21:46, respectively. Malzhan came in 81st place with a time of 22:27 and Smith finished in 90th place in a time of 22:38. 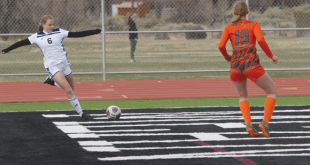 The totals from the team’s efforts gave them a fifth-place finish, one point behind fourth-place Pagosa Springs, and the top finish for a 1A/2A-size school. "I am tremendously impressed and proud of the race each of these girls ran," says Camp. "It was each and every place that the girls earned, working together, to produce this finish. It was a team effort, and in my book, the most impressive finish we’ve had, because the field was so much larger and more competitive than it has ever been. Our season as a whole has been incredible."